Twenty five years ago the model that was to epitomise the brand for the next two decades first appeared. Called the Century in honour of the hundred years in business the company was celebrating at the time, examples of it now operate across the globe and despite the successful launch of the i4 and i6 models that were intended to replace it, customer demand ensures that it remains part of the product range today. 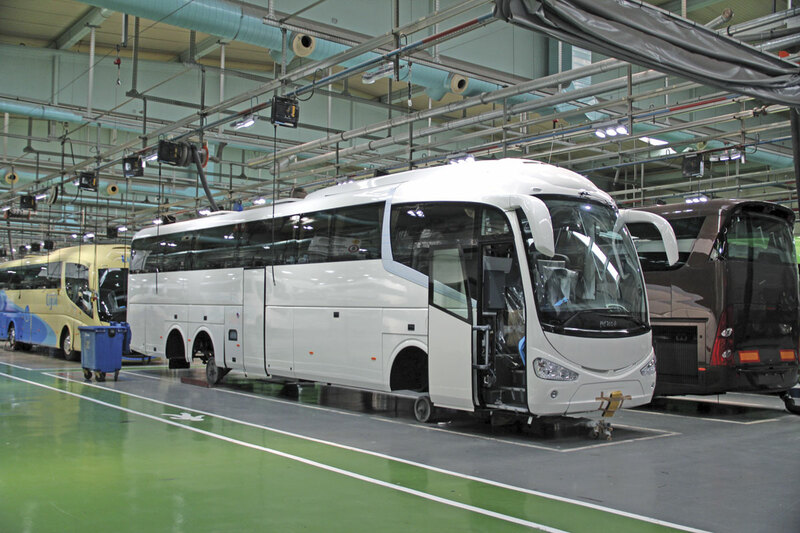 As recently as 1992 Irizar’s total annual production was only around 250 units though it had already started looking at the worldwide potential for growing its scope with a, since discontinued, joint venture in China. In the following year it began a relationship with Scania in the UK that has seen its coaches become a familiar sight across Europe and beyond, and in 1995 a programme of international diversification began. 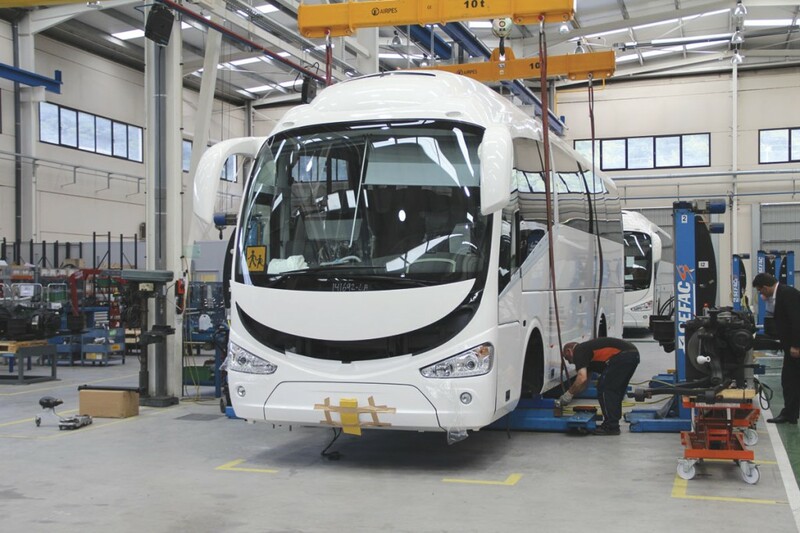 Today, Irizar has six manufacturing plants on five continents, opening new facilities located in Brazil, Mexico, South Africa, Morocco and India. Last year, for the first time, the Mexican plant produced as many vehicles as the main Spanish plant at Ormaiztegi in the Basque region of Northern Spain. Total worldwide production in 2013 was 5,368 units and turnover grew to a record of €556m (£440m). It was the third year in succession that Irizar turnover had exceeded the pre-recession record of 2008. According to the 2013 annual report, the group has total assets of almost €700m (£554m) and its own funds of approximately €400m (£317m). Some 88% of all sales are exports. Overall the company employs 3,500 employees across the six plants. Unusually, possibly uniquely for such a major vehicle producer, the business is not a publicly quoted company but a cooperative owned by 730 workers at the Ormaiztegi plant. A cooperative since 1963, it was once a part of the bigger Mondragon cooperative but the members decided to leave that some years ago in order to better achieve the future objectives of the business. Since 2008 the nature of Irizar has changed radically in order to equip it for the future in a constantly changing economic and manufacturing environment. Traditionally, Spain has been a body on chassis market with operators buying a chassis from a chassis manufacturer and then having it bodied by one of the many Spanish coachbuilders. This is still largely the case though the recession of 2008 has hit the country hard, reducing the size of the Spanish home market, in addition to which the major integral manufacturers are selling more complete integral products there. Elsewhere in Europe, the strong relationship with Scania that saw Irizar become one of a limited number of Scania preferred bodybuilders, was undermined by the launch of first the OmniExpress model and subsequently the Touring model built in China by Higer, though the two manufacturers retain close working ties, particularly in the UK. It became clear to Irizar that it was very difficult to survive as a pure bodybuilder and it therefore had to act to remain a strong player in the future. As Group CEO, José Manuel Orcasitas, explained, ‘instead of being frightened by the downturn, we looked at how we could turn it to our advantage and decided to develop complete buses.’ To this end Irizar determined to acquire the in house expertise to enable it to produce its own complete vehicles. It sought to acquire Spanish companies with expertise in the particular fields that it needed expertise, and which would also benefit and grow on the back of the extra work it could put their way. It already purchased Hispacold, the air conditioning specialists, in 1998 and Masats, with expertise in door and lift technology in 2002. It subsequently acquired: Jema, a specialist in high end power electronics in 2009; Datik, a technology company developing intelligent solutions in 2011; and most recently in 2013 bought Alconza, a company with experience in the design and production of electric motors and generators, hitherto principally for the offshore marine market. Having this additional expertise in house has not only enabled the development of the new i2e zero emission city bus, it has helped with the development of Irizar’s own range of integral coach products. The coaches are powered exclusively in Europe by Paccar/DAF engines, though the launch in North America later this year of an integral range will see Cummins units installed. The first integrals were unveiled in 2011 at the Birmingham Show, with the main launch soon after at the FIAA in Madrid. Impressively, integral versions of the i4, i6 and PB models were developed, with only the long serving Century model among its coach range not offered in integral form. To better harness the potential of the company as it moves forward, an impressive new research and development centre has been built and commissioned on the Ormaiztegi site, Called Creatio, it brings together expertise from all of the group companies in an atmosphere of innovation. As well as building the new headquarters for Creatio, the €18m (£14.25m) invested at the Spanish site last year saw the construction of a new showroom/delivery facility that can also be used for presentations and a dazzling new customer centre where customers can specify their new vehicles. 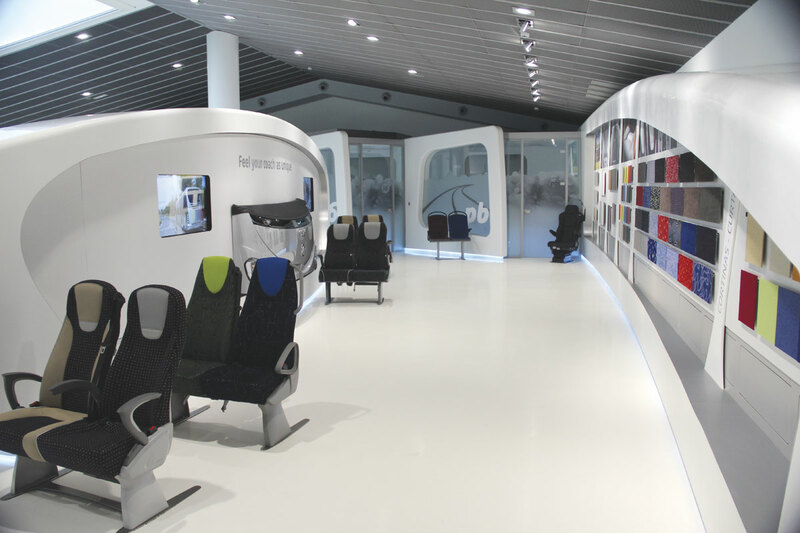 Equipped with everything you would expect in such a facility, the investment is not only a move to strengthen the buying experience for Irizar customers but a statement of the strength and determination of the brand to be seen as at least the equal of any other major player in the bus and coach market. To date, over 230 integral coach models have been built with the UK the most successful market for the product, taking over 100 so far. Other important markets are France, Poland, Denmark and the German market is also now being tackled. In the UK and France the company has set up its own directly owned subsidiaries and in other markets strong independently owned local partners have been appointed to handle sales. One of the most recent appointments is in the Benelux countries where a company headed by Wim Van Hool now has the dealership. This month will also see the i6 integral launched in Mexico. During 2015/2016 the coaches will be built in Spain but thereafter in Mexico. Development of the integral range continues and the latest coach product to be engineered as an integral is the shorter 10.8m version of the i6. This will initially be offered in France with the first UK version appearing at the Euro Bus Expo event in Birmingham later this year. Seating capacity can be up to 43 or 39 and a toilet. Quite a diversified range is being built up in the UK, focused on the i6 which is far and away the most popular model in all markets, accounting for over 90% of integral sales. Currently the UK options are: the 12.2m two axle i6 with up to 53 seats and a toilet; the 12.9m two-axle with up to 57 seats plus toilet; and the 13.8m three-axle with up to 61 seats and a toilet. The tri-axle is 3.7m high, whereas the 12.9m is nominally 3.5m. Under development with availability expected to begin in early 2015 is a new 13.2m tri-axle version that will be 3.5m high and powered by the 369hp Euro6 DAF/Paccar MX11 matched to either the fully automatic ZF Ecolife gearbox or the ZF AS-Tronic automated manual. Unusually, the change from Euro5 to Euro6 has not seen Irizar downsize its engine offerings, rather the opposite. In place of the choice between the nine-litre PR and 13-litre MX units, Euro6 gives operators the choice between the MX11 and the MX13 11-litre and 13-litre alternatives. The lower height i4 is available in right hand drive at 12.2m with 55 seats or 12.9m with 59 seats although new versions with ‘parachute’ emergency doors rather than the full second door currently fitted, will raise the capacities to 57 and 61 respectively. Also available later this year will be a new 3+2 layout 71 seater on the 12.2m chassis. It would also be possible to build a 75-seat 12.9m version if there were demand for it. Completing the current line-up is the integral version of the top of the range PB which can be supplied to order. At present, integral production is running at 11 units a month but that could be increased to one per day on one shift or two a day on two shifts. Spec for spec, a two axle integral will be around 200kg lighter than a body on chassis version while a three axle will be around 400kg lighter. Operators can specify whether to have the frame manufactured in stainless steel or, as most do, carbon steel. 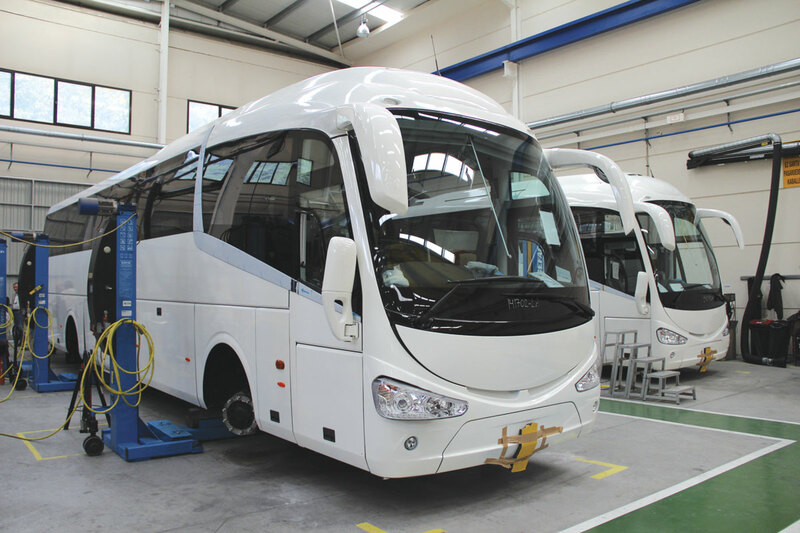 Over 90% of Irizar production remains of conventional body on chassis construction with integrals not yet offered in the majority of markets including, significantly, Spain, but also the Irish Republic where Irizar is only available on Scania chassis. Another strand of the revised post-2008 Irizar approach was to broaden the product range to include bus products with the introduction of the low entry i3 and full low floor i2 models. These were launched, initially on Volvo B7RLE chassis, at the 2012 Madrid Show and are already available in the UK on Scania chassis. The company is pleased with how the i3 launch has gone with between 90 and 100 expected to be sold this year. Examples have already been delivered in the UK, Denmark and Spain with a 60 bus order for the local Bizkaibus scheduled to commence delivery after the summer holiday period. Chassis are Volvo, Scania and Mercedes-Benz. Arriva’s Madrid operation has placed an order for delivery before the year end. 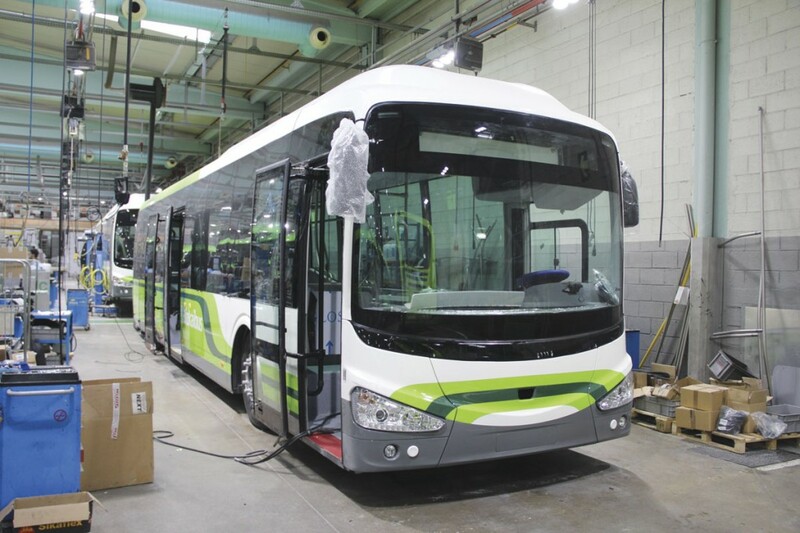 Construction of the i3 takes place at Ormaiztegi on the same lines as the coach range, though it appeared during my visit that bus manufacture was focused on one of the six lines. Irizar’s plans for the bus market always went far beyond simply offering bodies on chassis but there was a recognition that to convince potential buyers it was necessary to offer something that provided more than just another ‘me too’ bus. From the outset the plan was to position the company at the forefront of the European market with a product that would be seen as the benchmark in the sector. The original plan was to develop a hybrid but research suggested that what cities were really looking for was a true zero emission vehicle. 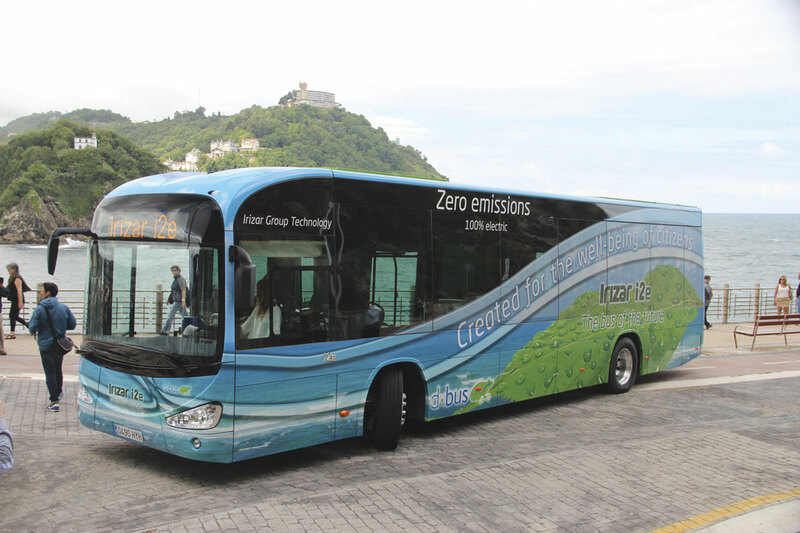 It therefore decided to develop a fully electric bus option and with the launch of the i2e Irizar has done just that. 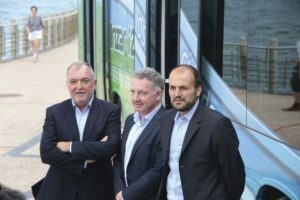 Supported by local Government as part of an ongoing and wider project and with the help of funds through the EU’s ZeEUS project, in which Irizar is participating, an initial development bus has been followed by a second bus that will go into service with D-Bus of San Sebastian, the local fleet that has been working closely with Irizar on the creation of the i2e. Two more are already in build for Barcelona. Within the ZeEUS project Irizar has been working with the Technalia, Ceit and Vicomtech research centres. Group CEO, José Manual Orcasitas, said that he didn’t know yet how fast the demand would develop, but Irizar would be able to deliver from 2015. 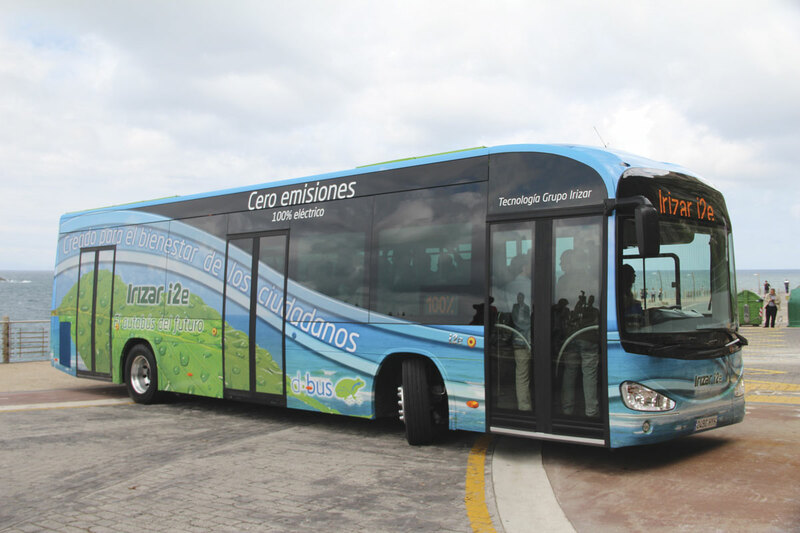 Describing the technical features of the i2e, Electromobility Programme Manager, Hector Olabegogeaskoetxea, said that electrical systems were 65-70% efficient compared with the 25-30% efficiency of a diesel engine. It was important that the bus operated with the same flexibility as a diesel and to this end the i2e would run for 14-16 hours on one five hour overnight charge. This would give it a range of between 200-250km on most duties, depending on driving cycle and weather conditions. A number of additional strategies have been developed in order to achieve the range including a pre-cooling system that ensures the bus is already fresh and cool when it leaves the depot, so the systems do not have to use a lot of energy to bring down the interior temperature, merely to maintain it at the start level. The on board Eco-Assist telematics system helps the driver to conserve energy and also provides him and the operator with information. It was designed to be a bus both for now and the future, adaptable to meet changing needs. For this reason there are a number of energy strategies being pursued which could see alternative charging solutions become available in the future. The energy storage solution developed by Jema for the bus is a hybrid combination of batteries and supercapacitors that Hector said would reduce energy consumption and lengthen the life of the vehicle. He believed that energy consumption would be the differentiator in the future. The supercapacitors are rated at 125V. Made in Switzerland, the batteries are So-Nick (Sodium-Nickel) units with a total capacity of 376kWh and a nominal voltage of 600V/650V. These are less expensive than Lithium Ion units, are 99% recyclable and meet the needs of the vehicle. The single Synchronic electric motor is the Siemens DB2016 unit. This has been specially developed for Irizar to give 15% more power and torque. It has a nominal power of 180kW (230kW maximum), developing nominal torque of 1,400Nm (peaking at around 3,100Nm). It drives a conventional drive axle. Also developed within the group was the cable charging system which currently runs at 125 Amps and takes five hours. He held out the possibility of reducing that to three to four hours in the future. We were also told that the company is working on a bus that automatically recharges. Hispacold supplies the air conditioning system which provides 35kW for the passengers and 3.5kW for the driver, with a separate heating system delivering 25-28kW for the driver and 13kW for the passengers. Structurally, the almost completely recyclable bus features an aluminium bolted structure in order to minimise weight to compensate for the batteries it carries. It is also mounted on alloy wheels. The roof has to be strong because it carries 3.5 tonnes of componentry including most of the batteries, the air conditioning set (which is heavier than that on a standard diesel bus) and the supercapacitors. Hector stressed the safety of the i2e which he claimed was the first city bus to meet the ECE R66.01 rollover requirements, while the software complies with ISO 26262. It has ASR and creepage (hill hold) control and withstands side and frontal impacts. Reliability tests at IDIADA simulating 12 life years or 600,000km had already been carried out. He also stressed that every bus can be customised to meet the needs of the operator and a particular route, not only in respect of the interior layout but in the performance characteristics of the driveline. Several seating layouts are offered within the three double door layout. The bus we were shown had 24 standard seats, four priority seats and two wheelchair bays giving a total capacity including standees of 73. Irizar have applied for patents in respect of a number of design aspects of the electrical systems and as these have yet to be confirmed they were reluctant to show us beneath the rear panels of the bus. They also confirmed that there are further developments of the project, including inductive and conductive charging methods with pantographs added to the roof that they are still working on and are therefore keeping confidential for the time being. Adding a three to five minute recharge at terminals could give the vehicle unlimited range. At the moment only a two axle model is being offered. The obstacle to articulated versions is that the weight would be too high because too many batteries would be required to give a good capacity. Hector thought that opportunity charging would be required to give a 250km range with 160 passengers. Crucially, because it frustrates me going to Europe to see buses that we cannot buy, the i2e will be available in the UK, though there is recognition that the requirements are different. I understand that both a 12m bus and a 10.8m model are envisaged. In some UK applications the range requirement would be lower so some batteries could be removed and it is also debatable whether the climate control system would be required. I was told that Irizar would like to have a product in the UK in the first half of 2015 and would also like to have a customer on board at that time. ‘We have a customer we are talking to,’ said Hector. Speaking to him later, he said that the 250km range on one charge would enable him to cover 95% of the company’s routes every day. 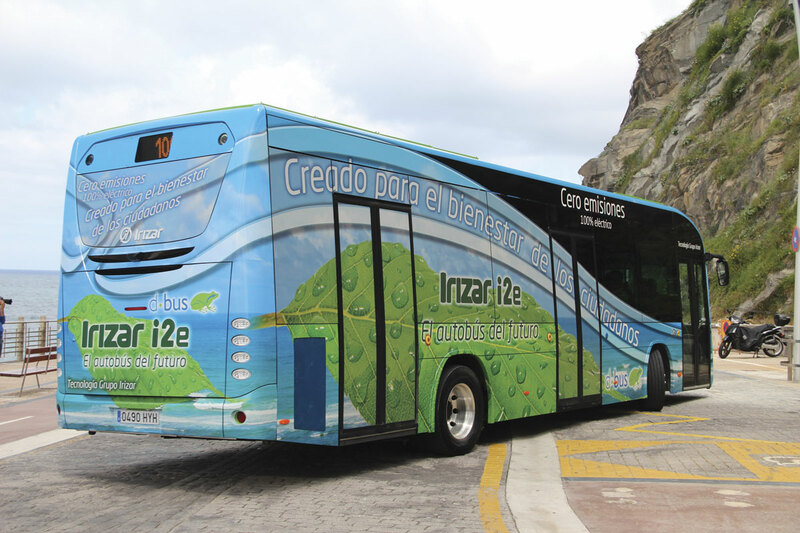 Irizar had used on board data capture to monitor all of the company’s routes during the project. Average bus speeds in the city are somewhat higher at 17kmh than the 14kmh average across Europe. 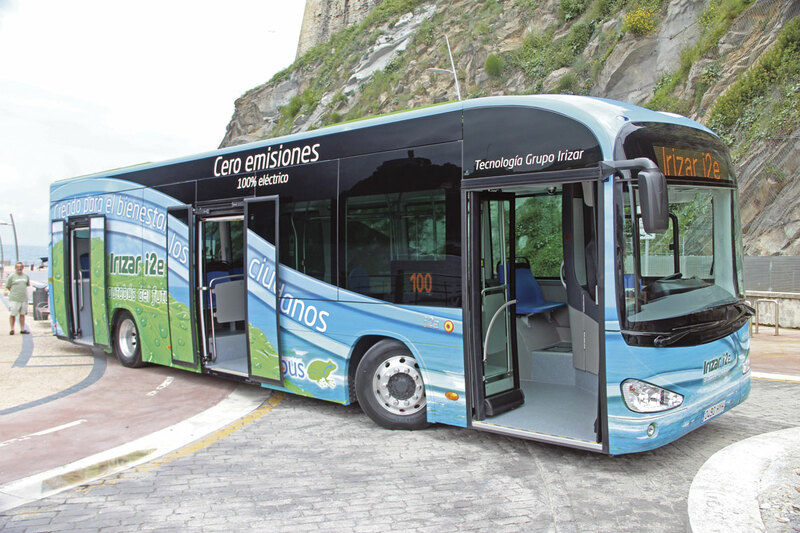 He said that using the bus would save 88 tonnes of CO2 and 33,000 litres of fuel annually. After the launch and the first trip around the town carrying politicians and senior figures, we were given the chance to ride on the i2e around the streets of San Sebastian. I’m not sure that if I were looking to impress people with my new creation I would choose to take them over several hundred metres of pave for their first experience of it, but the location of the launch event made this inevitable. In practice, it showed how very taught the body is with little or no body noise evident, as far as I could tell. With so many journalists and Irizar staff talking excitedly it was difficult to accurately judge the noise characteristics though there was an air compressor pump I could hear fairly frequently. Finding a silent alternative to this component is one of the tasks the development team has set itself. The ride quality was very good and though we didn’t perform any particularly demanding manoeuvres, it felt stable and well balanced. Braking was smooth and quiet and performance was good within the limitations of the city environment. Unlike some fully electric buses I have been on, this bus is genuinely fully electric; it doesn’t have separate diesel generators powering any of its ancillaries and neither does it have poorly sited battery packs compromising the view or the interior atmosphere. I liked the use of air conditioning vents that were very coach-like in appearance and the general feel of the bus was welcoming, though I thought the cove panels could be made less bulky and more aesthetically appealing, even allowing for the very obvious budget locks specified by the operator. This point aside, its credentials for city work are impeccable. I’ve lost count of the number of visits I have made to Ormaiztegi over the past 21 years, but on every one of them there has been something new to see, either in the development of the plant, the company or its products. It is less than a year since I was last there but on all three counts the move forward has been dramatic. The premises, especially the customer areas, are as good as the best, while the new i2e is not only convincing it is something I would never have thought possible from the company only a few years ago. One of the things I have always liked about Irizar is the pride of its people in what they do and in their region, coupled with their openness and willingness to treat everyone they work with as part of the family. As the company has grown and moved into new sectors it would have been very easy to lose this feeling of intimacy which is a tangible part of the Irizar brand, but the company hasn’t done so.